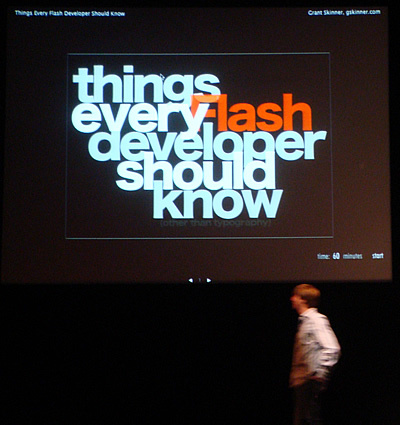 If you know anything about Aral, it is that he is one of the most prolific Flash community members. Between managing OSFlash.org, running his own web conference, and producing several open source projects of his own, this guy is always up to something. Create: make something that works (anything) and worry about evolving it later. Stop worrying about architecture -- crappy code is better than no code. In essence, you can always change things later, just get it working and out there. Share: By sharing your idea before you even create anything, it will create a responsibility for you to actually get it done. 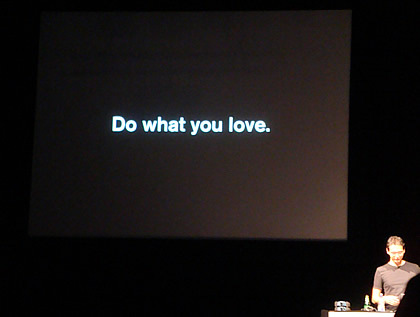 Profit: Make money doing what you love. Maybe you can't just up and quit your full time job yet so you can work on your own projects, but you can start on the path to making that a reality. Making a little bit of money from your side projects will help that along nicely. Play: Experiment - there are no mistakes. Make and use "happy" tools - those that are simple, practical, hackable and delightful. 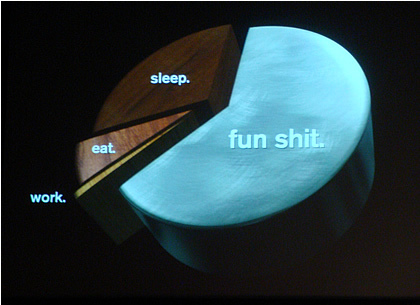 Do your projects and the tools you use to make them give you joy? All great ideas to consider, and things that the community needs to be reminded of occasionally. I often find it too easy to just get into the daily grind, and I'm sure that is the case for others in the community as well. Jeremy started off talking about flocking rules, how he uses them in his work, and how they apply to emergence. 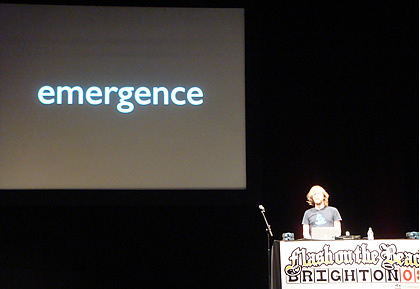 Jeremy has come up with a framework of sorts for his work with emergence called Agent-Oriented Programming (AOP). Most useful for a large number of small, stupid agents, AOP is built on top of OOP and allows agents (objects) to make decisions allowing large communities to collectively solve problems. In AOP, agents interact to solve individual goals. Since they have mental components such as beliefs, choices and commitments, and are allowed to make mistakes, AOP makes for the perfect model for real-life systems. One of these systems is the stock market, an industry in which Jeremy is currently working to help them model the success of and/or predict the future of stocks. Using similar principles, Jeremy also modeled the old game of Rock, Paper, Scissors to see who would win most often. Certainly worth checking out Jeremy's talk next time you have the chance. If you read my blog, there is an really good chance you know who Grant Skinner is. Grant described his talk as "the high-level talk I wish someone had given me five years ago", and honestly, I felt like I would have benefited more from this talk a few years ago. Grant is a great speaker and I certainly learned from this session, but there just wasn't that much new information for me here. I was really hoping for a much more technical talk like the last one I saw him give wherein he provided a lot of useful tips for developers. Grant broke his talk into three sections: development, tools and misc. For development Grant provided a quick overview of OOP, frameworks and more, explaining why these are essential knowledge. Tools covered both developer (such as FlexBuilder) and business (such as BaseCamp) tools that developers should be using. Lastly, misc contained some overall good tips on both development and business. You can view Grant's slides for his talk here. 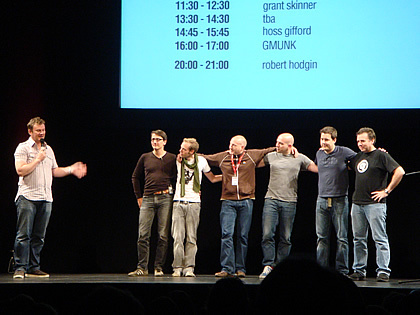 Last year when a presenter had to cancel at the last minute, John Davey organized a "Speaker Jam" where some of the better-known presenters all got up on stage and contributed 10 minutes to the talk. 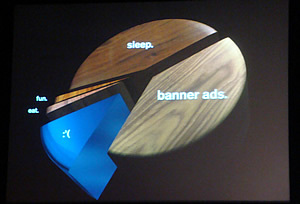 It was a good way to see items that the speakers might not have time to show in their normal sessions or maybe the content just didn't fit the theme of their talk. This year when one of the speakers didn't get their visa for international travel quick enough to board the plane, John once again decided to have a speaker jam. 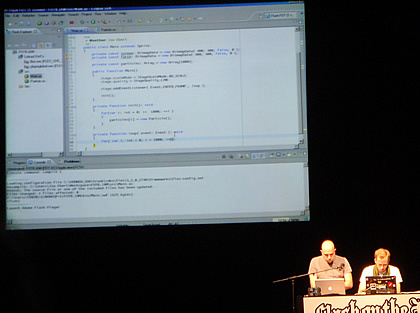 This year it included: Andre Michelle, Joa Ebert, Keith Peters, Carlos Ulloa, Mario Klingemann and Ralph Hewert - and this session was the most packed of the conference. 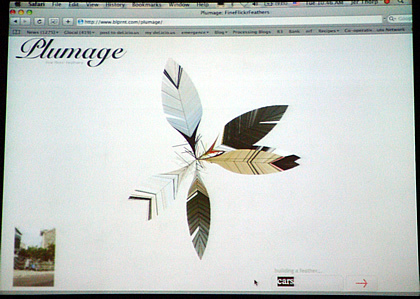 Next up was Keith Peters who discussed creating art from code, and his process for doing so. 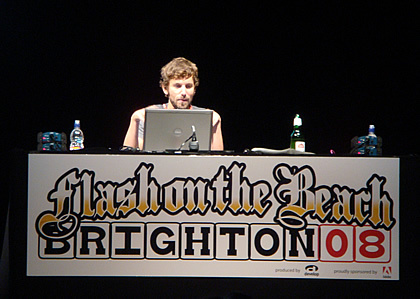 I think the most impressive portion of the talk was Joa Ebert who did a live coding session with a 10 minute time limit to create the best possible visualization in Flash. These speaker jam sessions always end up being one of the best parts of the conference. 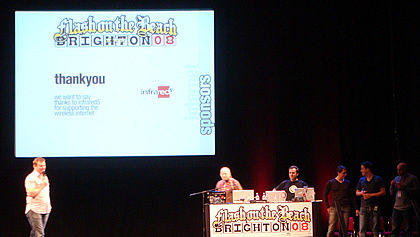 John, if you end up reading this, you should really build this into the conference schedule at FOTB Miami and next year for Brighton! 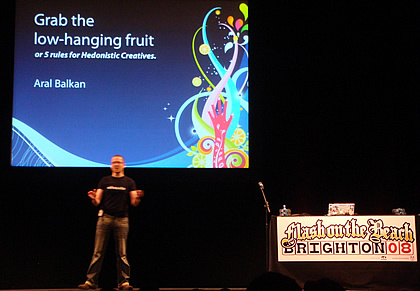 Lee's talks are always informative and since Lee has more of a developer focus with his platform evangelist role at Adobe, his talks are usually more centered around developer topics, with some helpful design elements here and there. For instance, Lee made the point that "interactive = code", and if you'd don't want to code at least a little, you are not an "interactive" designer. 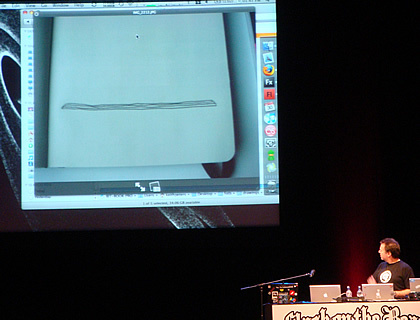 As with most of the Adobe team attending FOTB this year, their main focus was to inform everyone of the upcoming CS4 releases and Flash Player 10 features. 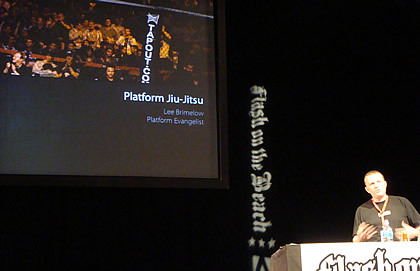 Lee's talk was no exception, but he was able to sneak in some great ultimate fighting training and videos! 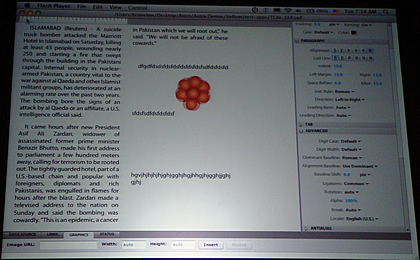 As with most conference Lee attends, he has a pretty good summary of the conference on his blog. This talk was excited me because I went in expecting to see the same work Robert showed last year at FOTB, and not much else, but rather I was surpisedwith a whole new theme and some great new work. 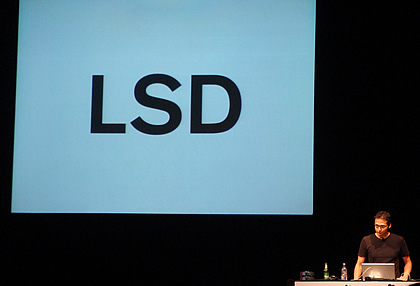 I chose the above photo to start off the recap of Robert's talk because, as it turns out, drugs were a huge theme among the speakers this year. Not that any of them encouraged the audience to go out and take drugs, but most of them have had some run-in with drugs that altered their path to becoming what they are today: brilliant and innovative creatives. 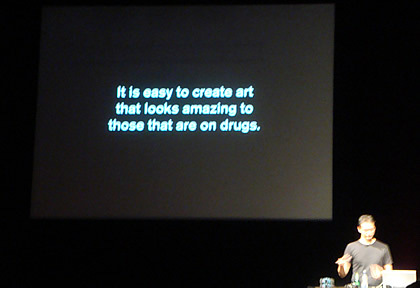 Which is to say that creating art while on drugs probably won't result in anything groundbreaking or worthwhile, but it may open your perceptions up enough to allow you to create something innovative. And by creating something innovative enough times, people will start to buy your skillset based on the work they have seen. 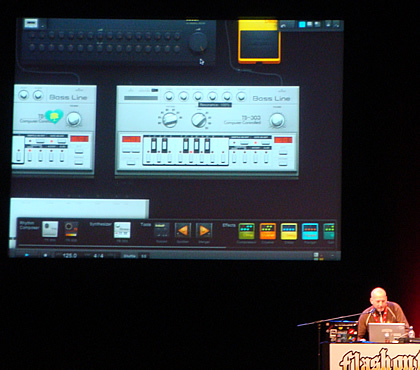 Here are some videos of Robert sharing his work, which (although Robert would not confirm it - must be some legal issue with Apple) includes the latest iTunes visualizer included in iTunes 8. You can follow Robert's progress on his Vimeo page and check out his recap of the conference this year on his blog. If you get a chance to see Robert speak, I highly recommend you make an effort to do so. Always inspirational and a great example of how following your own desired path can lead to success. You can follow my semi-consistent #fotb twittering throughout the conference by following this link to twitter search.